1 of 1 Heat oven to 350 degrees F. Line two 12-cup cupcake pans with 20 paper liners. 1 of 4 Whisk together flour, cocoa powder, sugar, baking soda, baking powder and salt until blended. 2 of 4 Beat milk, malted milk powder and espresso powder on medium speed. Add canola oil and eggs; beat until blended. 3 of 4 On low speed, add flour mixture to milk mixture; beat until smooth. Add sour cream and vanilla and beat until combined. Stir in miniature chips. 4 of 4 Divide batter among prepared muffin cups, filling halfway. Bake at 350 degrees F for 15 to 17 minutes or until a toothpick inserted in centers comes out clean. Cool cupcakes in pan on wire rack for 2 minutes. Remove cupcakes to rack; cool completely. 1 of 2 Beat confectioners' sugar and butter on medium-low speed until well-blended. Add vanilla and heavy cream; beat for 2 minutes, until light and fluffy. Beat in cherry preserves until well-incorporated. 2 of 2 When cool, frost the cupcakes with a knife or offset spatula. 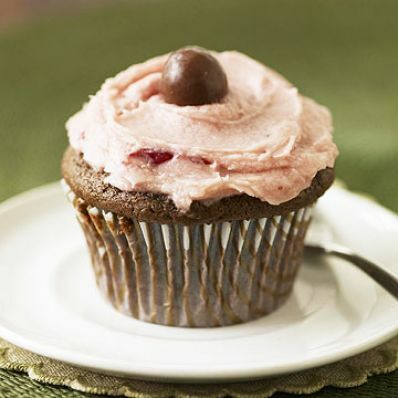 Garnish the top of each cupcake with a malted milk ball or cherry and serve.